General objective of this article is to Determine an Exchange Rate, in financial market perspective. An exchange rate is the cost for exchanging one currency for another. Exchange rates oscillate regularly through the week since currencies are increasingly being actively traded. That makes the price fall and rise. 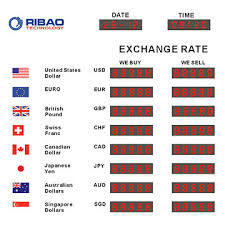 The price for a currency on the market differs from the rate you will get from your bank whenever you exchange currency. This article also briefly explain Market Exchange Rates, Understanding an Exchange Rate, Conversion Spreads etc. to determine this.